Adam Block sent SPACE.com this photo of the new supernova in Messier 82 on Jan. 23, 2014. He captured the image from the University of Arizona’s Mount Lemmon SkyCenter using a 32-inch Schulman telescope (RCOS), SBIG STX16803 CCD camera, and Astrodon Gen II filters. “Keep in mind this image is stretched in its brightness. 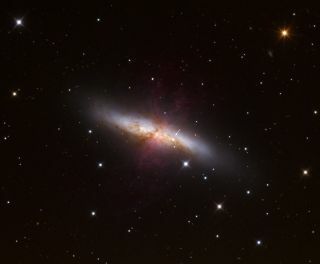 The supernova is considerably brighter than any part of the galaxy and as it brightens it may outshine billions of stars in M82,” Block wrote SPACE.com in an email. An arrow shows the location of the supernova. At 12 million light-years away, a new supernova that suddenly appeared in a nearby galaxy this week is the closest star explosion to be spotted from Earth in at least 20 years, so it's no surprise that it has captured the attention of stargazers. Professional astronomers and amateurs skywatchers alike have rushed to their telescopes to capture images of the brilliant star explosion, which was discovered by students at the University College London. So far, astrophotographers from Puerto Rico to Arizona have sent SPACE.com stunning photos of the new supernova in the galaxy M82. Former NASA scientist Fred Herrmann of Huntsville, Ala., captured an image of the supernova in M82 on Jan. 22, 2014. Herrmann shared a shot of M82 that he took on Nov. 28, 2013, before the star explosion became visible; in that earlier image, not even a pinprick of light is visible in the spot where the supernova appeared. Night sky photographer Mike Hankey also snapped a photo of the supernova from Auberry, Calif., on Jan. 23, and M82's new addition is even featured in an image snapped on Jan. 20 by Ezequiel Benitez in Isabela, Puerto Rico. Because the new supernova is 12 million light-years away, the star explosion actually occurred 12 million years ago. But Earthlings are only getting a glimpse of this cataclysmic event now. Mike Hankey sent SPACE.com this image of the new supernova spotted in Messier 82 on Jan. 23, 2014. He captured the photo from Auberry, Calif. using a RCOS 14.5 telescope, Apogee U16M camera, Paramount ME mount, and SBIG 402 with MMOAG Off Axis Guider. Supernovas aren't rare events in the universe, especially not in so-called starburst galaxies like M82 (which also goes by the name of the Cigar Galaxy). However, supernovas are rarely spotted so close to Earth. The last closest one was Supernova 1993E, first observed in 1993 in the galaxy M81, which, like M82, is about 12 million light-years away. Before that, Supernova 1987A appeared in February 1987 only about 168,000 light-years from Earth, in the Large Magellanic Cloud, a dwarf galaxy that's a satellite of the Milky Way. The new supernova is especially exciting for astronomers because it's been identified as Type Ia — the kind of supernova scientists use to measure distances across the universe.